Stuffed long capsicums- A mild aromatic sweet variety of long green capsicums, stuffed with a spicy mixture made from ground peanuts, chickpea flour (besan), fresh coriander and an array of spices. Gently topped with a savoury tomato gravy, it’s a simple but tasty dish, an ideal accompaniment to any Indian flat bread such as roti or paratha. 1 tablespoon fresh chopped coriander. 2. Make a slit a long the length of the capsicum on one side only. Do not remove the stalk although you may remove part of the membrane and some of the seeds from the stalk end piece. 3. Dry the capsicum pieces and keep aside. 4. Mix all the ingredients listed in the stuffing list above . It should make a crumbly mixture. 6. Place the stuffed capsicums in a steamer and steam for 20 mins until tender (alternatively can be cooked in microwave in a covered dish for about 8-10 mins till tender. 7. 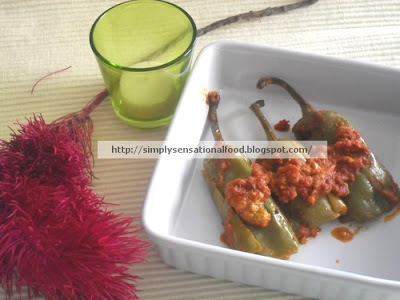 While capsicums are steaming, heat 2 tablespoons of oil in a shallow pan, when hot add the mustard seeds. 8. Add the blended tomatoes and tomato puree and sauté. 10. Cook the gravy till spices infuse in to the tomatoes and the gravy starts to leave oil. 11. Remove the capsicums from the steamer and place over the tomato gravy side by side. Do not stir other wise capsicums will break. 12. Gently spoon over some of the gravy over the capsicums. 13. Cover the pan and warm through the capsicums on low heat about 5 mins. Transfer to serving dish. Serve with indian flat breads such as rotis or parathas. Oh Yum! That looks so delicious and it sounds Mmm Mmmm GOOD!!! This is a very interesting dish and I've never cooked something like this before, can't wait to give it a try. Thank you for participating and wishing you the best of luck! Yummy...I love the stuffing ingredients. 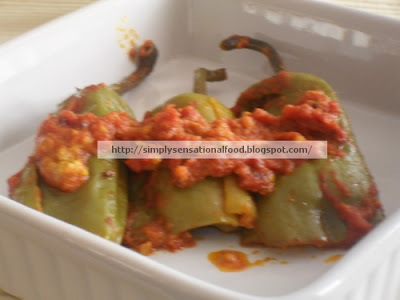 These stuffed Capsicum look good:) Healthy, easy to make and yummy! I answered your question about difference between vegetable shortening and butter in my blog.. Here it is again. Butter is made from milk. Fat from milk is churned into getting butter. Vegetable shortening is made from vegetable or corn or soyabean oils which are compressed to change their molecular structure so that they solidify at room temperature. Lard is also considered shortening, but is the fat from pig which is compressed to solidify too. Hope this helps. Thank you for bringing that to my attention. When I saw it, the preview was OK. I have moved its location hope you can read the post without any disturbances. Oh WOW ! that looks real yummy. All luck to you with the event.